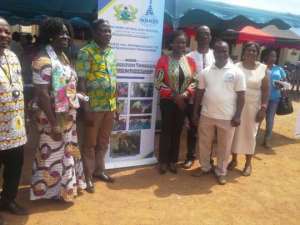 The National Board for Small Scale Industries (NBSSI) has launched one of its flagship programmes, the Apprenticeship to Entrepreneurship Programme (A2E) at HoHoe in the Volta Region. A2E aims at strengthening and institutionalising the apprenticeship and technical training of the Board and also to scale up the programme throughout the country over a two year period. The launch is in line with government's vision of strengthening the skills of the youth and creating jobs. Through this programme, the MCE also mentioned that they had reduced the Business Operating tax for Master Crafts persons who supported the NBSSI Apprenticeship to Entrepreneurship programme and who were also part of the Association for Small Scale Industries (association supported by NBSSI). He said through the incentive, they had actually increased their tax base because more artisans were interested in the association. As at last year, two districts, Hohoe in the Volta Region and Obuasi in the Ashanti Region had implemented the programme in Ghana, which targets the unemployed youth of the various districts seeking employment. The selected youth are matched with Master Crafts persons within their districts and also enrolled in existing associations to provide mentorship and guidance. During the period of training, the carefully selected Master Crafts persons will train the apprentice in: Dressmaking, Hairdressing and Barbering, Masonry, Carpentry, Catering, Electricals, Air-condition and Refrigeration Repairs, Leather works amongst many other trades. The National Board for Small Scale Industries will supplement the training with management, entrepreneurship and mentoring services and at the end of the training programme, apprentices will write the NVTI exams. After their graduation, the trained unemployed youth are either retained by the Master crafts persons as employees or supported to set up their own businesses. On average, 200 youth per district are targeted. In 2017, 950 persons benefited from the pilot A2E programmes in two districts, 21,468 NBSSI participants received technical training, 1,142 persons sat for the NVTI exams and a total of over 5,600 jobs were created through the support of NBSSI and its partners. "As the A2E expands across Ghana, we hope to train 10,000 youth in two years in various trades to help reduce the unemployment rate amongst the youth in Ghana," Ms Yankey said. The NBSSI A2E programme is an upgraded and job focused version of all the apprenticeship and technical training programmes being undertaken by NBSSI in partnership with its main partner Rural Enterprises Programme (REP) as well as the District Assembly and Association of Small Scale Industries (ASSI). It is also to equip the teeming unemployed youth with employable skills to support our existing entrepreneurs, and with entrepreneurial skills to create employment.